Mandalay, the forgotten city. When people speak about Myanmar they often rave about Bagan, Inle Lake and Yangon. However, Mandalay does not seem to fit in with the other three. 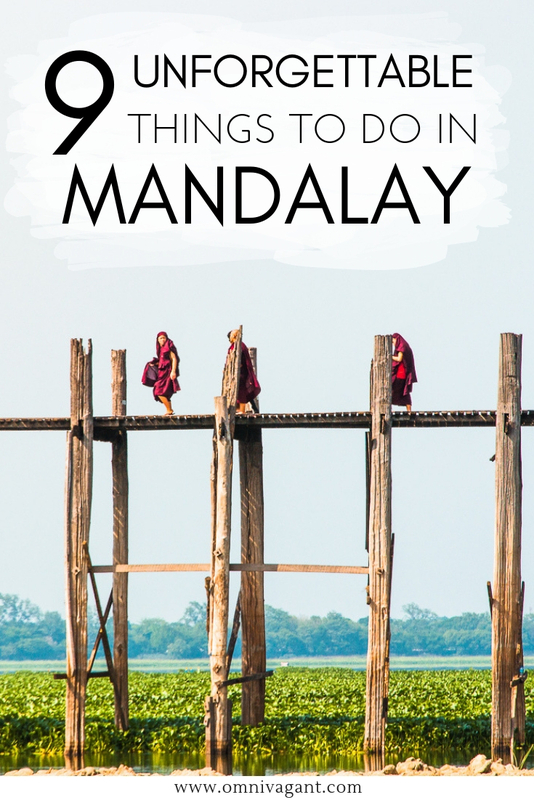 But Mandalay is a hidden treasure, and a city that definitely should not be forgotten on your Myanmar itinerary. 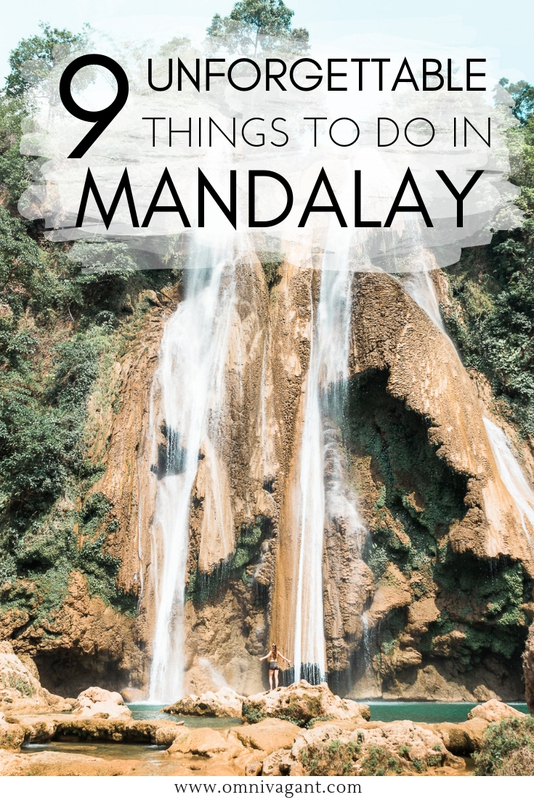 From stunning waterfalls to palaces and beautiful temples, there is something for everyone’s liking in Mandalay. Mandalay is a paradise for adventure lovers and for culture seekers, spend a couple of days exploring this beautiful city finding the most beautiful places. 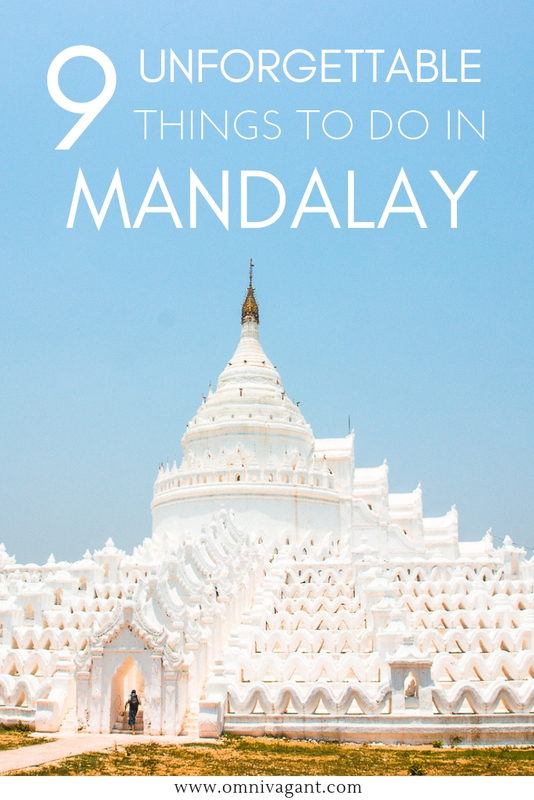 Read here everything you need to know about visiting Mandalay and things to do in Mandalay. Mandalay is a city located North from the touristic destinations of Yangon and Bagan. The city has slowly been increasing in popularity with backpackers and travelers, and has now become a must visit destination on everyone’s Myanmar Bucket List. The city can easily be visited by bus from Yangon, Bagan or even Inle Lake. 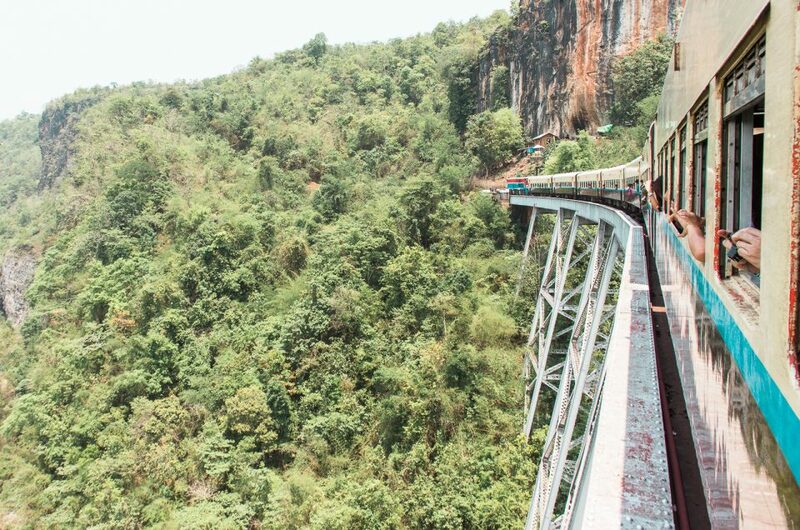 And while these four destinations together are the most popular destinations in Myanmar, consider taking the train to Hsipaw to see the beautiful Goteik Viaduct from the train, the most beautiful train ride in Myanmar. With the tourism rising in Mandalay, it won’t be hard to find a hostel, hotel or guesthouse to stay at with your personal preferences. From budget accommodation to luxury accommodation, Mandalay has it all. Check out here some of the most popular places to stay at for backpackers traveling Myanmar. Ostello Bello Mandalay – Ostello Bello was the first chain of hostels to open in Myanmar and now has four hostels opened, spread between Bagan, Mandalay and Inle Lake. For years Ostello Bello has had the “to-go-to” popularity with backpackers, solo travelers and budget travelers and that popularity has not decreased. Ostello Bello has large dorms, an amazing social vibe and beautiful hangout spaces for everyone downstairs and at the rooftop. What else are you looking for? Check out the latest rates and reviews for Ostello Bello Mandalay here! Ace Star BnB – While Ostello Bello might be the most popular place to stay at, it is not the only place in Mandalay to stay at for backpackers and travelers, and more hostels are popping up, as such also Ace Star BnB. A recently refurbished hostel with budget dorm rooms in a central location in Mandalay. Reviews have spoken highly on the friendly and helpful staff. This hostel is slightly cheaper then Ostello Bello, so is perfect for travelers who are on a strict budget. 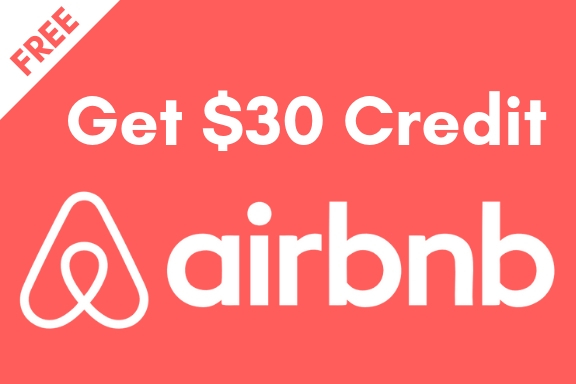 Check out the latest rates and reviews for Ace Star BnB here! Hotels in Mandalay – Not a big fan of staying in hostel dorms, perhaps looking for a bit more luxury or a bit more privacy, don’t worry there are enough options for you as well. From small guesthouses to luxury accommodation, there is something for everyone. 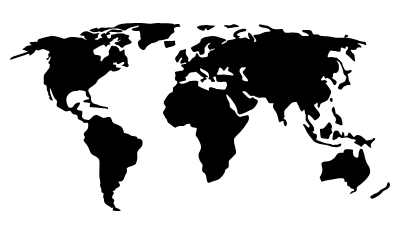 Check out the map below to find a place that works best for you! 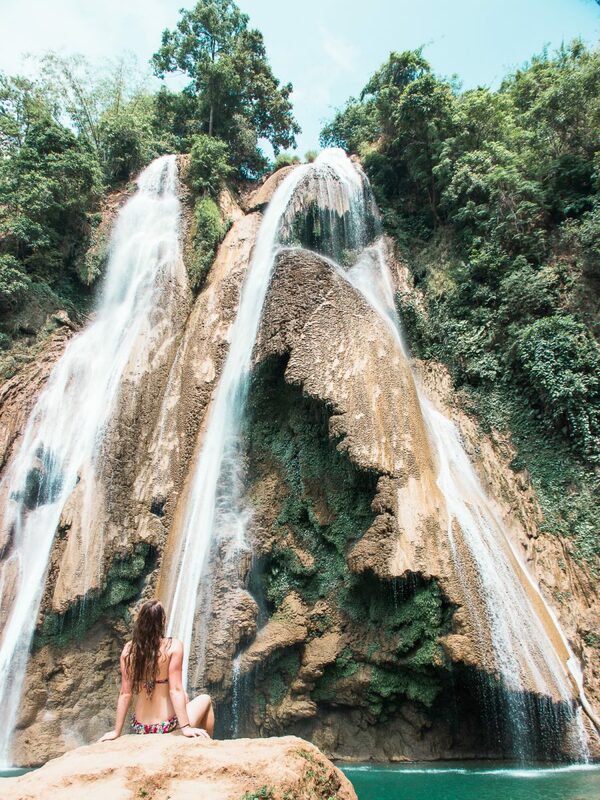 A stunning waterfall, perhaps one of the most stunning waterfalls of Southeast Asia. 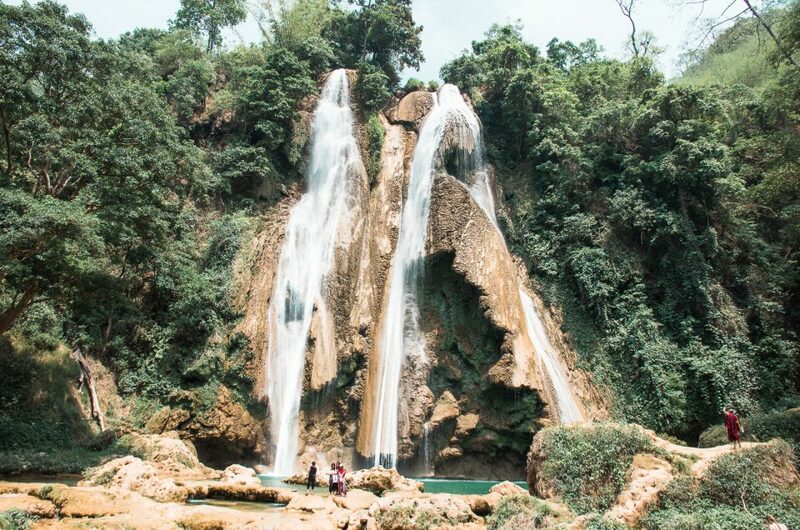 The Anisakan waterfall are not exactly walking distance, and are situated in the next town over: Pyin Oo Lwin. While the Anisakan falls are not the closest thing to do, it might be the most adventurous and the most beautiful natural sight to see in Mandalay. While there are several waterfalls located, the most impressing and the most stunning out of all of them is the Dat Taw Gyaik, pictured on the photos below. With a large pool having form at the bottom of the waterfall it is a great place to go for a refreshing swim and to escape the heat for a day. The hike to the waterfall is down a steep road, and with 45 min to an hour to get there, this is not for everyone, but the ones that make it will be rewarded with the most stunning view. Best time to visit the Anisakan Falls – The best time to visit the Anisakan Falls is early in the morning, you will avoid the large crowds at the waterfall and the temperatures will be lower, it will get warm later in the day and the 1 hour hike down can become hard and sweaty. Shortcut – There have been travelers warning not to take the shortcut that locals recommend, as this cuts through jungle and on a pair of trainers or sneakers can become quite slippery and dangerous. Read some of the stories here on Tripadvisor. Entry Fee for the Anisakan Falls – There is no entry fee for the Anisakan Falls, but travelers have reported that since the falls started gaining popularity people are trying to offer guides (women walking down the waterfall with you and then wanting money) and being followed by men on motorbike drivers on the way up asking if you want a ride up, also asking for money. Be aware of this before going as some people enjoyed having these services available, but a lot of people have described it as bothersome. Many travelers have reported about this happening at the waterfall, read all about it here in the reviews on Tripadvisor. The Hike to the Anisakan Falls – The hike down to the waterfall is steep and requires some endurance as especially in the heat it can be strenuous. The hike down will take roughly 40 min to 1 hour and the hike up can easily take 1 to 2 hours. As such it becomes more of a day activity then a simple stop on your way of exploring Mandalay. Mandalay Palace, located in the centre of Mandalay, is the last royal palace of the Burmese monarchy. The palace was constructed between 1857 and 1859 and was home to the last two kings of Myanmar: King Mindon and King Thibaw. Mandalay Palace is built inside a fort, and it’s beauty cannot be witnessed from outside these walls. Visiting Mandalay Palace is one of the most popular tourist things to do in Mandalay. Take a walk around the compound and admire the beautiful palace from up close. Many of the buildings were destroyed during WWII and in the 1990 replicas of the original buildings have been built. Mandalay Palace Entry Fee – Visiting Mandalay Palace may be one of the most expensive things to do in Mandalay, as the entry fee is 10000 Kyat. Opening Hours of the Mandalay Palace – Mandalay Royal Palace is open daily from 7.30am to 4.30pm. 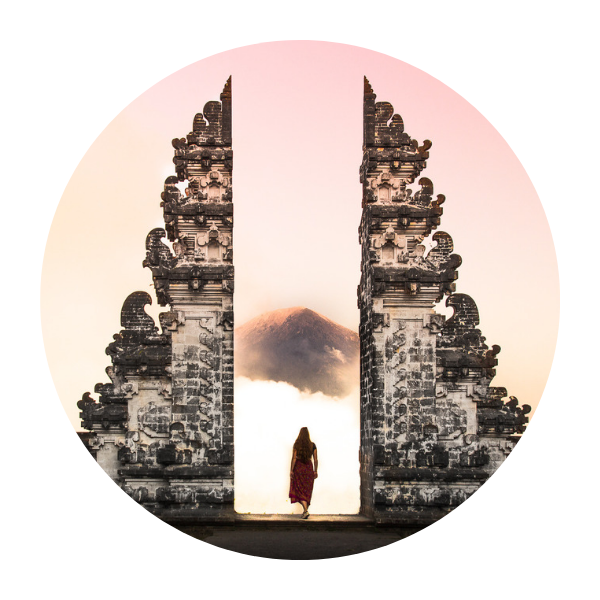 East Gate entry – The Mandalay Royal Palace is a massive compound, and foreigners can only enter from the East Gate, located on 66th street so be sure to find the right gate. Travelers have reported in the past to be shown ID before entering. Watching the sun set at Mandalay Hill might be one of the most magical sunsets you will see in South East Asia. I have been lucky enough to have seen it twice, in 2015 and 2017, and I would go see it again in every following year if I could. Mostly, it is the view that creates the magic of the sunset, however, this time it is the location, the pagoda, that makes it so incredibly beautiful. The Su Taung Pyae Pagoda on top of Mandalay Hill is covered with a mosaic of broken colored mirrors, reflecting the golden sun rays of the sunset. The whole temple illuminates in a golden glow, creating that unique sunset you won’t find anywhere else in the world. Mandalay Hill Entry Fee – The entry fee to Mandalay Hill in 2018 was 1000 Kyat, which equals to roughly 1 USD. On some days tickets are sold for the use of cameras, these tickets are sold at a price of 2000 Kyat. Mandalay Hill Dress Code – As you are visiting a pagoda, be sure to dress respectfully. Make sure your shoulders and knees are covered and you take your shoes of upon entering the temple. Best time to visit Mandalay Hill – The best time to visit Mandalay Hill would be at sunset. 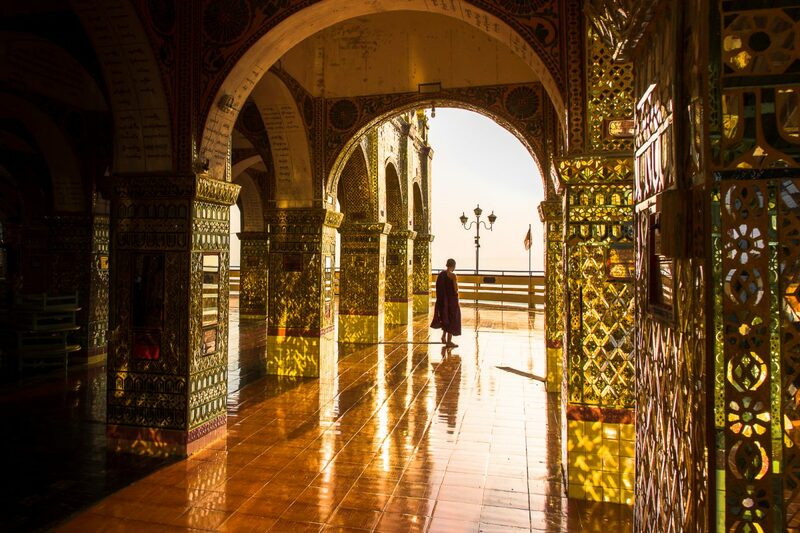 While the view is undoubtedly spectacular at any time of the day, the beautiful golden mosaic of the Su Taung Pyae Pagoda are most stunning during golden hour. How to get to Mandalay Hill – From the centre, or your accommodation, get a taxi or rent a motorbike and drive up Mandalay Hill yourself. Parking is roughly 300 Kyat, and it is short 10 min drive from the centre. The Kuthodaw Pagoda, located at the foot of Mandalay Hill, is known to be holding the world’s largest book. And while one might be looking for a traditional book, it is actually the hundreds of stupas that are home to the marble slabs that contain the teachings of buddha. 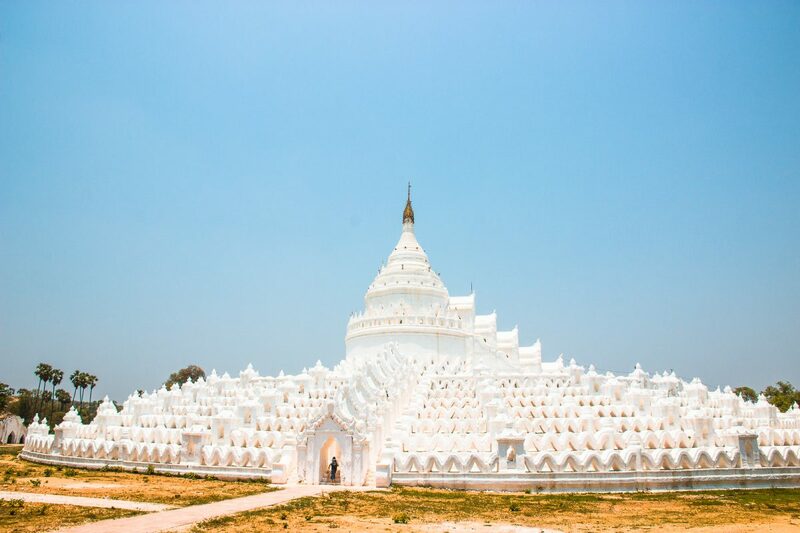 There are 729 white stupas each containing a slab with a the dimensions of 1.07m wide, 1.53m tall and 13cm thick. The teachings of buddha are inscribed on both sides of the slabs, and the stupas are arranged around the central golden pagoda. Visiting the Kuthodaw Pagoda is one of the most unforgettable things to do in Mandalay, and might even be one of the most unique temples of Myanmar. While not exactly located in the city of Mandalay, the Hsinbyume Pagoda is located only a short (and beautiful drive) away from Mandalay, and trust me, it is worth it. The white pagoda is different from any other pagoda you will ever see, standing bright in a field of brown soil. Climb up the steps, walk around, go all the way to the top, and enjoy the amazing view from the Pagoda. Even though the pagoda is white, the floor can still be hot, so be sure to head to the stepping stones located in the middle of the temple so you don’t burn your feet! The Hsinbyume Pagoda has been gaining popularity with travelers and backpackers, and has easily became one of the most popular Instagram spots in Mandalay. Entry fee to the Hsinbyume Pagoda – While there is no specific entry fee to the pagoda itself, there is an entry fee of 5000 Kyat to the archeological area. This also includes the Mingun Pagoda & Bell. Best time to visit Hsinbyume Pagoda – With the increased popularity of the Hsinbyume Pagoda on Instagram be sure to visit this temple early in the morning to avoid the crowds. How to get to the Hsinyume Pagoda – The Hsinbyume Pagoda is located roughly 1.5 hours North West of Mandalay, at the same archeological site as the Mingun Bell and Pagoda. The easiest way to get there is my getting a taxi or by renting a motorbike and driving there yourself. If you are looking for some more off the beaten path adventures in Myanmar, be sure to put the Dee Doke Waterfall on your list. Think about dreamy blue lagoons surrounded by lush green scenery, what else do you need. Visiting the Dee Doke Waterfall is the perfect activity for a day of escaping the crowds and taking a break from sightseeing and to simply go for a refreshing swim. However, it takes a bit of an effort to get there. 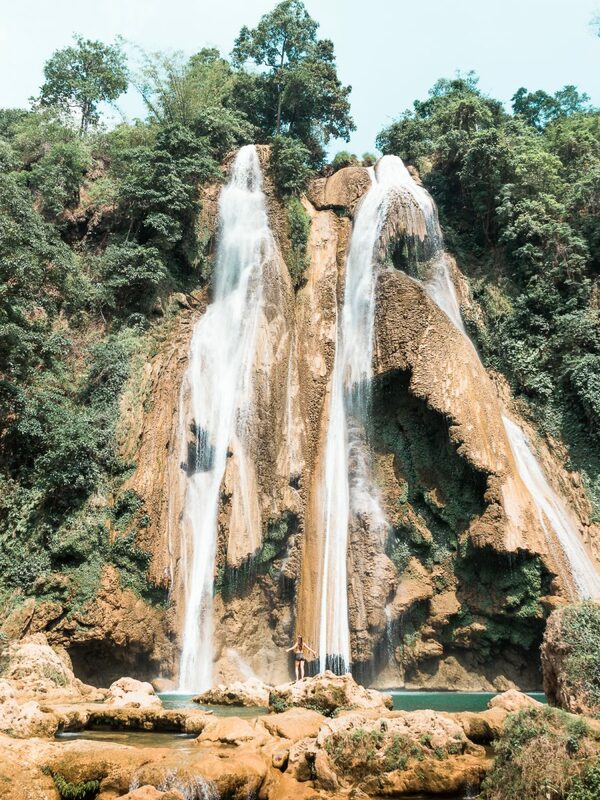 The Dee Doke Waterfall is located roughly 1.5 hours Southeast of Mandalay. 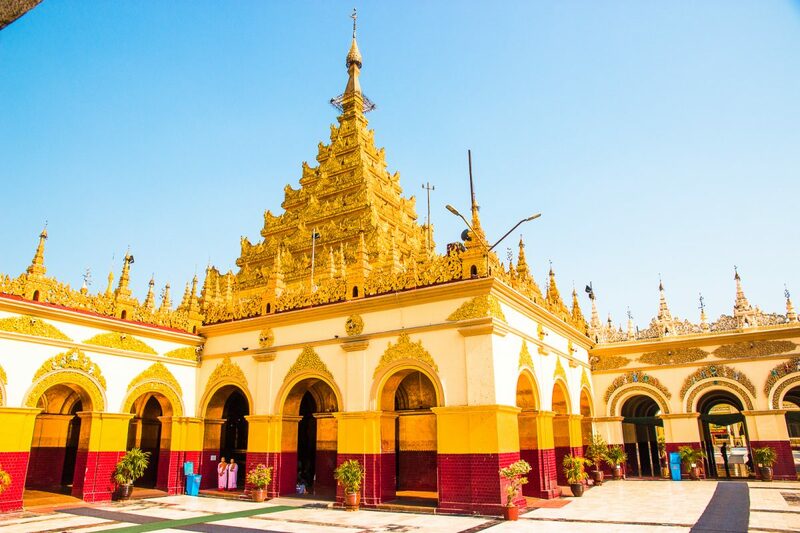 The Mahamuni Buddha Temple is located Southwest of Mandalay and is known to be a major pilgrimage site for Buddhists. Buddhists come to the temple, where men buy a small golden leaf to stick to the buddha, with tons of people watching and worshipping at the same time. Stick around long enough and you will hear a beautiful performance as song by and played by a group of men. The place is packed with locals; we didn’t even encounter one other tourist there and is a slightly more off the beaten path activity then visiting for example Mandalay Hill or the Hsinbyume Pagoda. Mahamuni Buddha Temple entry fee – The entry fee to the Mahamuni Buddha Temple is 1000 Kyat. If you want to use your camera inside, there is another small fee of 1000 Kyat. Dress code for the Mahamuni Buddha Temple – As you are visiting a temple, be sure to dress respectful. Have your knees and shoulders covered and be sure to take of your shoes before entering the temple. How to get to the Mahamuni Buddha Temple – The temple is located roughly 20 min by motorbike or taxi out of the centre of Mandalay and can easily be combined with other activities. 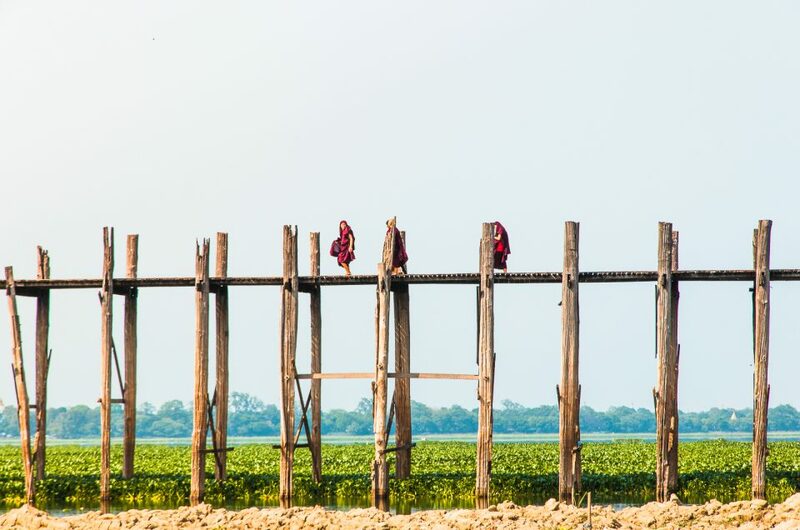 The U Bein Bridge is the believed to be the oldest and longest wooden bridge in the world, and supposedly best to be seen during sunrise or sunset. Sadly enough, I had already used up my sunsets for other locations (and was too lazy to get up for sunrise), so I visited the U Bein bridge in the middle of the day. It is still a beautiful sight, perhaps a bit more impressive after rain season… The reflections are stunning, and the bridge is well visited by locals and tourists. The U Bein Bridge is one of the most photographed places of Mandalay, and are a must see when visiting this beautiful city. Best time to visit the U Bein Bridge – The best time to visit the U Bein bridge is early in the morning to avoid other tourists. Many monks and locals use the bridge as a commute early in the morning, which is quite the sight to see, and the reflections will be most beautiful around this time. How to get to the U Bein Bridge – From the centre of Mandalay it is roughly a 30 to 40 min ride to the U Bein Bridge, located Southwest of Mandalay. The Mingun Pagoda and Bell are located a stone throw away from the Hsinbyume Pagoda, and are a must see when visiting this area of Mandalay. Construction of the Pagoda had begun in 1790 under the rule of King Bodawpaya, but the pagoda was never finished. Massive cracks can be seen in the Pagoda, which are the are the result of an earthquake in the eighteen hundreds. Nearby the Mingun Pagoda, you can also visit the Mingun Bell, which currently holds the record as the second largest bell in the world, weighing 90 tons. Entry fee to the Mingun Pagoda and Bell – As mentioned above, there is no specific entry fee to the Pagoda and Bell, instead there is an entry fee to the archeological site, which includes the Hsinbyme Pagoda. This fee is 5000 Kyat. 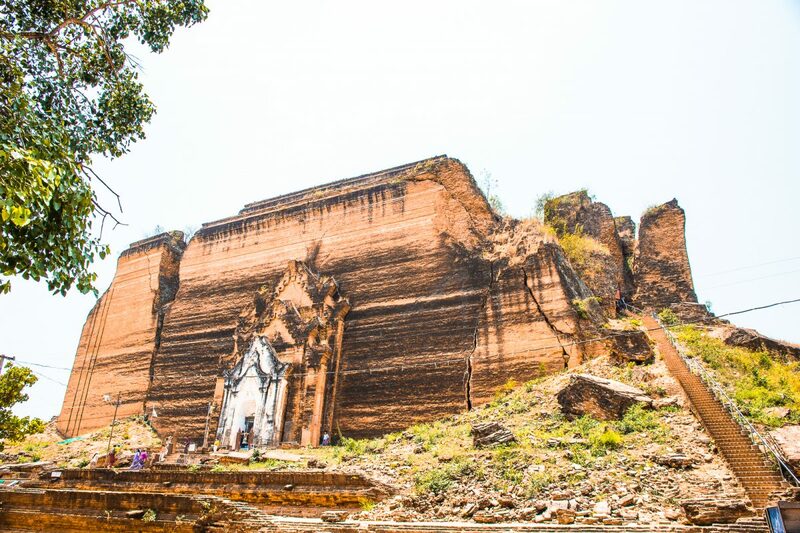 Best time to visit the Mingun Pagoda – The Mingun Pagoda is a large touristic destination in the Mandalay area, and as such it is best to visit as early as possible to avoid the crowds. How to get to the Mingun Pagoda and Bell – The Mingun Pagoda and Bell are located roughly 1.5 hours out of Mandalay. The easiest way to get here is by either renting a motorbike yourself or to take a taxi. Myanmar is home to some stunning sights, and while Mandalay might be one of the highlights of your trip, it is definitely worth to explore the rest of Myanmar. Not sure where to go? Start of in the former capital of Yangon, or perhaps check out our complete Myanmar Bucket List for some more travel inspiration. You can find all our other Myanmar articles here, oh and don’t forget to pin it for later! This is so amazing! I would love to visit. I love their architecture so much; it must be one of the coolest, most intricate forms in the world. Thank you for sharing! Thanks! It is such a beautiful place, I would go back in a heartbeat!